The Belang Mums arranged for my birthday lunch when I was recovering at the ward last January. They ARE that optimistic I will make it to 17 February for many more years to come. Amin. 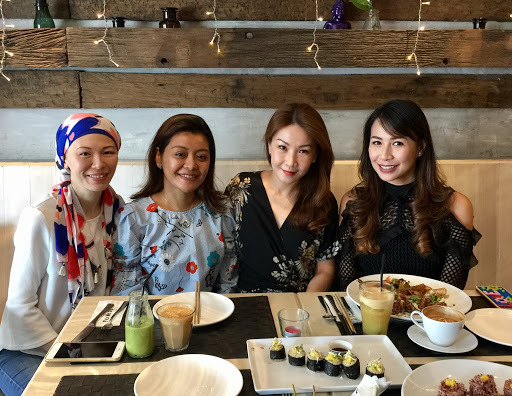 On Thursday, we gathered for a wonderful lunch at Ashley's in Telawi, Bangsar for a scrumptious treat of organic food. Green juices, water with lemon and my delicious platter of nasi ulam with grilled shrimps. The flourless chocolate cake was moist. We even lit a candle or two and sang me my birthday song. The last time I did sing a birthday song in public at my own birthday was Hard Rock Cafe 20 years ago! I am glad Drama Queen found a dish she loves to eat again and we already plan to go back for more! Except she is not allowed to pay for future meals. InshaAllah, we will find many reasons to celebrate since her birthday is way too long to wait! The Belang Mums bought me really generous gifts which I never expected so you can imagine my happiness when I opened them much later just to prolong my suspense? The one thing that struck me that day during lunch was how smart the 3 other Belang Mums are. Ask them anything (HR, Finance, Chemist by former profession so can you imagine their super brains?) and they know the answers like an open, talking and walking Google. They are increasingly beautiful inside out so I much growing/catching up to do! Their sincere love, light and laughter are most uplifting! I was crying inside (with gratitude) because the day I found out via ultrasound that I was really ill with my multiple fluid filled cysts was November 2016 when we were supposed to gather for combined lunch for 2 of the Belang Mums' birthdays. I did not make it to that wonderful lunch as I was at Prince Court on an emergency basis. Fast forward 3 months and look where we are. I never could have imagined this. Allah swt is indeed the best of planners. Speaking of hospital and celebrations, we also celebrated my latest MRI report. On Friday, The Other Half, Bean and I went to pick up my decadent flourless chocolate cake decorated with fresh fruits from another beautiful inside out school mom whom despite her ultra busy schedule, fitted my request in, at the very last minute! The Grandparents came to The Flat Next Block for a day trip so we could celebrate with Girl and Bean after school. It was a warm homely celebration with loved ones, and surely feels like Allah swt has granted my every wish for gratitude, love and health. Syukur alhamdulillah and thank you to everyone for allowing me such indulgence this 41st birthday. Sounds like a perfect bday to me. Alhamdulillah. Happy Blessed Birthday! To many many more link bridge and makan meet ups! Sure thing, kale is on the menu *big grin* HUGS.